Many of the large brands that were participating at SB’11 were in agreement that sustainability isn’t just about the perception of being green and doing less harm to the environment. It’s much more than that. It makes good business sense and has become a profitable driver for those who can make it work. Today sustainability is about using less or alternative energy, creating less waste and seeking materials and input ingredients that are much more in harmony with the environment rather than being harmful. And of course while doing all of this the company still makes the process of sustainability profitable while also ensuring its business practices are transparent. Take any product manufacturer for example and the sustainability mission is about creating and fulfilling a system that starts with the sourcing of raw materials to increasing efficiencies across the supply chain, to streamlining the production and manufacturing process. Then it’s onto improving and reducing packaging and simplifying the distribution channel that ultimately leads to the end consumer and finally the product end of life-cycle phase where recycling, biodegradation and/or reuse come into play. 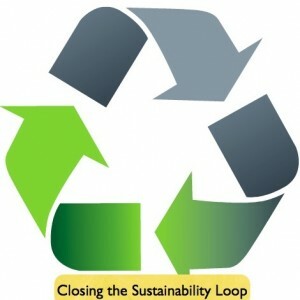 To be completely sustainable a business strives to create a life-cycle loop where eventually it will give back to the earth what it has taken – and all in an environmentally and socially responsible manner. Over the last 20 years many consumers have become jaded to the idea of “green” products. There has been a lot of push back on prices being higher than “regular” products and in some cases the quality of the green product may be viewed as being inferior as well. 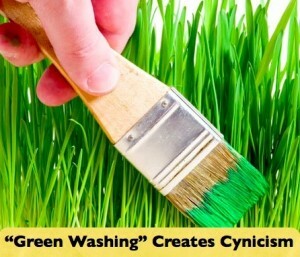 According to a research study that was conducted by the Shelton Group along with the help of psychologist and speaker John Marshall Roberts, there is a wide gap between those who are active and seeking out green products and those who are indifferent or flat out skeptical about their value or “green” cause. Most people fall somewhere in between and according to Roberts the messaging needs to focus on consumer worldviews rather than the product being advertised as environmentally friendly. Roberts presented an insightful workshop that focused on “inspiring sustainability in skeptics” where he addressed the two-sided issue of consumer cynicism versus hope by reviewing the various value systems people hold onto. Roberts identified several categories of “consumer worldviews” that ranged from deeply held traditional beliefs to more holistic views. On his blog Roberts states, “worldviews truly DO drive people’s day to day choices as they relate to sustainability, and are the secret key to creating lasting behavior change in cynical or apathetic consumer groups.” By understanding what motivates consumers Roberts asserts that we can learn the keys to what drives consumer behavior that include the “what”, “how” and “why’s”. And it’s up to the marketer to use empathy in order to create messages that will truly resonate with consumer values. 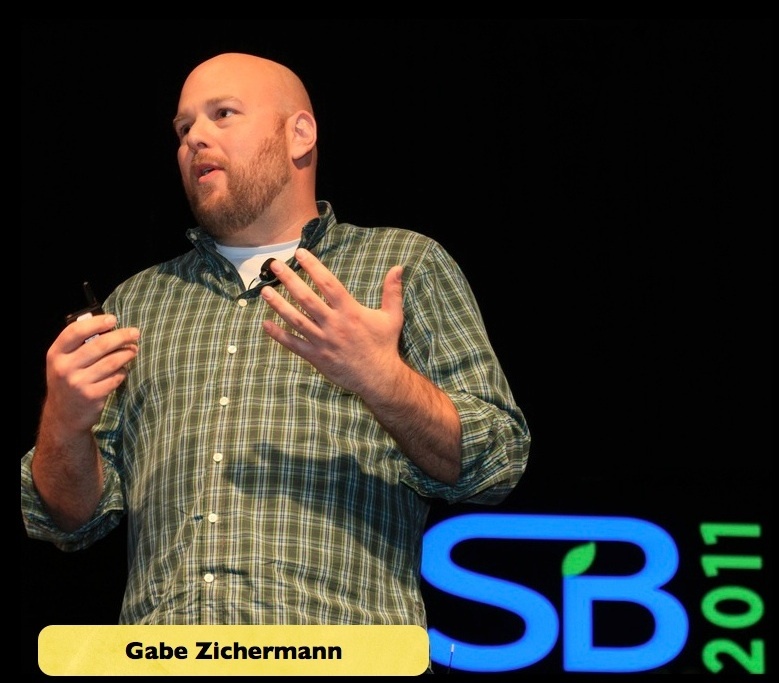 The theme at SB’11 was “Play On” and Gabe Zichermann eagerly discussed how Gamification has fast become a clever and proven method to engage consumers due to its social competitiveness and attractive reward systems. As Zichermann defines it “gamification is the process of using game thinking and mechanics to engage audiences and solve problems.” His premise is that we can make anything fun and he uses examples of unlikely – but very popular – online games such as Zynga’s Farmville and Air Traffic Control Chief to illustrate his point that the subject matter can be separate from the pleasure one receives from gaming. Oddly enough the idea of status has been found to be the most important incentive while cash rewards are a distant second. Incorporating sustainability into this concept, Zichermann cited how hybrid car manufacturers such as the Ford Fusion are building fuel efficiency games right into the car’s dashboard console. VW also has also been hard at work for the past few years with its Fun Theory where much of the resulting publicity for their cool programs can be seen on YouTube. The idea is to make otherwise dull and uninteresting subjects (recycling, composting, fuel efficiency, etc) become fun and engaging through games that offer social rewards and thus keep people motivated. There were many great insights this year at SB’11 and it was encouraging to see so many like-minded business people come together for a great cause that is much more than being good stewards of the environment. It’s about creating smart and profitable business practices that will ensure their growth and survival over the next several years. It will be interesting to see what the progress report will be next year at SB’12. This article can also be seen on Science Creative.